Topslip is a most popular place located in the Anamalai mountain range in the Western Ghats about thirty kilometers from Pollachi in South India. 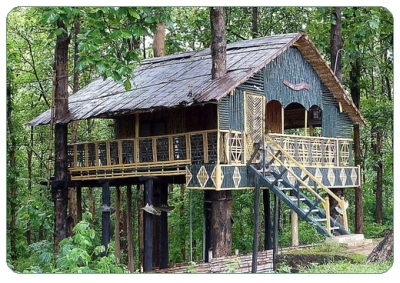 The spot perched at a height of 240 metres above sea level is famous for its wildlife sanctuary and national park that are in proximity. Topslip is very good tourist place near Pollachi. The World Tourism Organization defines tourists as people who "travel to and stay in places outside their usual environment for more than 24 hours and not more than one consecutive year for leisure, business and other purposes not related to the exercise of an activity remunerated from within the place visited”. 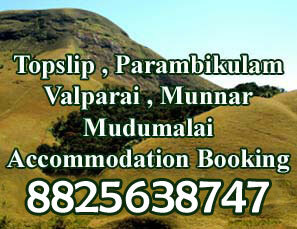 In these occasions Topslip is a very good vacation place in India, Tamil Nadu, Coimbatore. Topslip is located in the Anamalai Mountain range of 240 m (800 feet) from the sea level. Topslip is the Tiger Reserve Forest in small part of Anaimalai Tiger Reserve, which is separated from the Nilgiri Hills by Palghat Gap in north. National Geographic as conducted a documentary about Topslip on 2010. That documentary is called has "Anamalai ". We, Anaimalais Wildlife Tourism is one among well known private tour operators in tamilnadu. Eventhough we have our head office in Pollachi, we expanded our service throughout Tamilnadu. hence we arrange all types of tours , we are special in wildlife tourism. We are not new to this field, we have 15 years of experience in this field. Our services include package tours, hotel / farm house / jungle lodge / cottage / estate bungalow booking, Car / SUV / Van / Bus rental, Airport pick-up / drop - off etc. You may choose from our pre designed tour packages or customize your own itinerary that suits your budget and level of comfort. We cover the following destinations : Pollachi, Topslip, Parambikulam, Valparai, Athirapally, Thirumoorthy Hills, Munnar, Palani, Kodaikanal . Activities at these places are sight seeing, trekking, boating, elephant safari, dusk safari, bird watching, nature & wildlife photography, yoga, ayurvedic massage & therapy etc. we will assure for your safety.